Monday Happy and Simple – It’s a Boy! Well today is a special Happy and Simple Monday post as I get to announce that I am a Grandmother to a wonderful baby boy. We are very excited and happy to welcome this baby into our family. 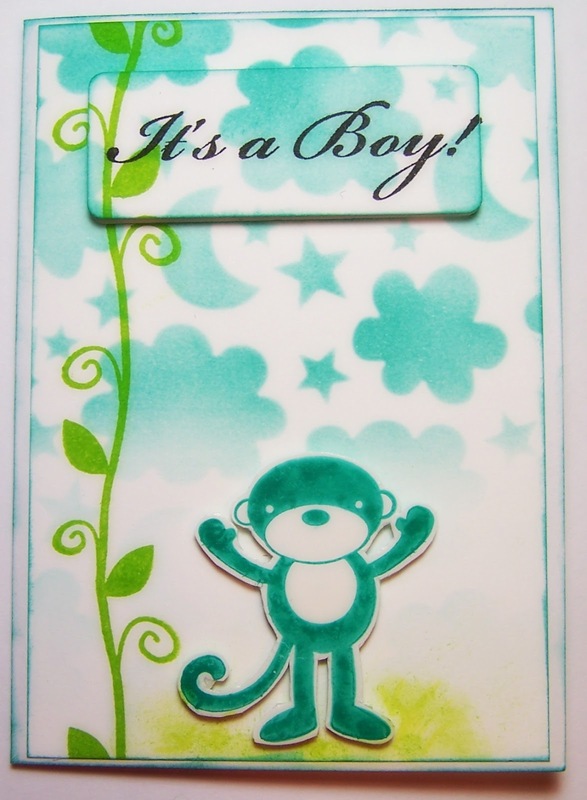 Below is the cute and simple baby announcement I made using an adorable monkey stamp from TPC Studio. The trick to keeping this card simple was to go with a limited color scheme and only stamped images. I stenciled the background with the same ink color (Aquatini) that I used on the monkey and then brought in a bit of green with the vine going up the side of the card. The saying was stamped in black, die cut, and then popped up with mounting squares. The monkey was fancy cut and also popped up with mounting squares. I edged both the focal panel and card base with the Aquatini ink prior to adhering the panel to the card base. Hope you enjoyed this cute and simple card!